SpaceWitch is creating content you must be 18+ to view. Are you 18 years of age or older? Thank you so much for your continued support! I hope I can continue to bring you all as much entertainment as I possibly can, for as long as I can! Access the new Supporters Discord Role! Access to sketched pages! Get even earlier access to my comics by reading pages I haven't even finished yet! Vote and discuss new bonus comic's! First look at new projects! Get inside information on new full length comics that include character concepts and previews! 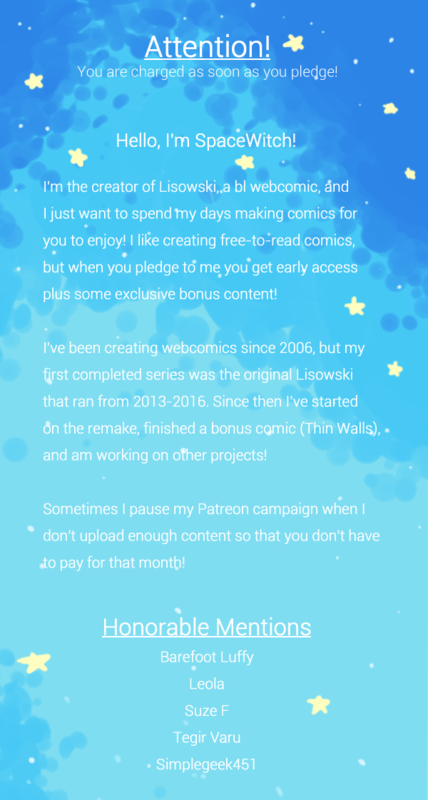 Access to all previous bonus comic's! **Rewards do not roll-over to the next month. If you fail to request a sketch for one month you lose it. Use the tag "Request"
Access a new Discord Role! Earn a spot for your name on the Star Lord Wall of Fame featured on my Patreon page! **Except the Monthly Sketch Request. This goal has already been met once!